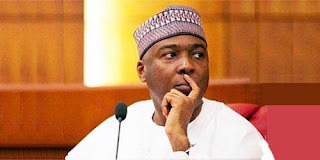 President of the Senate, Bukola Saraki, is currently at the National Assembly presiding over Tuesday's plenary after sneaking himself inside the lawmakers' complex. The Senate President, Bukola Saraki, whose convoy was blocked this morning by operatives of the Nigerian Police, reportedly drove himself into the National Assembly complex in a private vehicle. It was gathered that the embattled Senate president was not in the vehicle when a detachment of security operatives blocked his convoy at his Apo residence with the view to preventing them from leaving the house. Reports reveal that as early as 7:00 am, senators loyal to Parliamentary Support Group (PSG) had arrived the National Assembly to hurriedly Impeach Saraki as soon as he honours the police invitation, as signatures were said to have been collected overnight. to ensure that the party is able to thwart any attempt to “play a fast one and change the leadership of the Senate”. It was gathered that Saraki had also perfected his plans to announce his defection from the All Progressives Congress (APC) today and adjourn the plenary sine dine. As of the time of filing this report, the mood at the National Assembly was tensed, with policemen taking over the premises.